Stanley was born on June 12, 2012, weighing just 4.2 pounds, and was eight weeks early. This sweet little boy spent the first three weeks of his life under intensive care in the NICU. Finally, on a sunny summer day in July, Stanley’s family was finally able to take their precious baby home. The following months were typical months for a family with a new-born baby, until Stanley reached the 6-month mark. At that point his parents started noting that their baby seemed to be progressing slowly in areas such as: gaining weight, crawling, and communicating. After expressing concern to Stanley’s Pediatrician, doctors ran a series of tests, which confirmed his parent’s concerns. Stanley was soon diagnosed with Spastic Diplegic Cerebral Palsy, also referred to as spastic diplegia CP. Spastic diplegia is one of nine forms of cerebral palsy, categorized by extremely tense muscles and spasms. Leg muscles in particular tend to be severely affected, in turn, reducing range and ability of motion. CP is caused by damage to various parts of the brain, most often caused by a premature birth. In Stanley’s case CP has greatly affected his lower body, his core, and has challenged his cognitive learning. At just two-years-old, he underwent surgery to loosen muscle tension in his thighs. He has also had Botox treatments in various regions of his lower body, he wears AFO’s to help correct his feet into their proper position, he suffers from a partial lazy eye, and he relies on various forms of therapy to help strengthen and correct muscle development. To be in the presence of Stanley, one would not guess that this sweet loving child has started life off with such great challenge. He truly is a boy with a great big heart, an endearing tenderness, and he has a cuddly gentle disposition. His smile lights up the room and he is very easy to love. 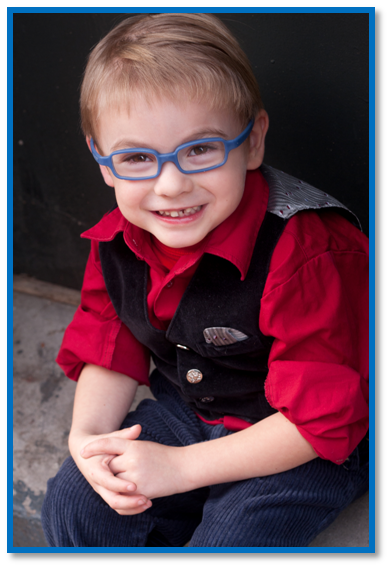 This courageous 4 ½ year-old is a fan of the kids show, “Wild Kratts,” he loves cars, and the iconic Star Wars robot, R2D2. Stanley will be adopted as a Sparrow to Griffin Creek Elementary. Students at Griffin Creek will work hard to raise money for Stanley through sponsored community service and fundraising projects.